A few years back, moviegoers had a big belly laugh when they heard that a movie studio was immolating $200 million on an alien invasion flick based on the 1967 board game Battleship. "Haw haw!" we innocently guffawed. "Obligatory bon mot about red and white pegs! You sunk my battleship! Insert mock glee about cultural fatuousness and strip-mined childhood memories here!" Battleship's newfound loot guarantees that some Snidely Whiplash lookalike in Hollywood is itching to fast-track a sequel. But what will Battleship 2 look like? Given that A.) nobody on the planet asked for a Battleship movie; and B.) Paramount Pictures is using the last uncurled finger on its magic monkey's paw to make Transformers 4 for 2014, it is my sincere belief that Battleship 2 will have nothing to do with battleships. Let's discuss the plot of director Peter Berg's Battleship (trailer here) for a moment. There's a yawning narrative gulf between Battleship the board game and Battleship the movie. Nothing about the former suggests the latter, save for the shared loose theme of naval combat (and some peg-shaped alien missiles). As I noted back in 2010, board game movies must plot that which is essentially plotless. Using the Milton-Bradley source material alone, Battleship's screenwriters at best could've penned a period war movie with the maritime historical credibility of Baywatch Nights. 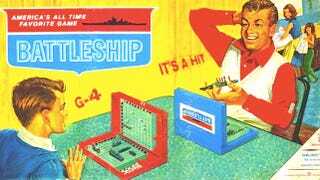 The scriptwriters also could've cobbled together decades worth of Battleship commercial ephemera. For example, we could've learned how quickly that wife divorced her husband (in the above 1968 box art) and what grandpa had for breakfast (in the TV spot at left). The film would be not unlike that GEICO caveman sitcom or an opera starring Domino's Pizza Noid or a sonnet about the Michelin Man. Battleship isn't exactly novel for being a movie based on a tabletop game (see: 1985's Clue and 2000's Dungeons and Dragons). No, Battleship is kind of exemplary for possessing source material that in no way necessitates what happens onscreen. The bare minimum the filmmakers needed were battleships, and the noun "battleship" alone does not have a plot (non-etymologically speaking). No, the movie Battleship relies on the audience's collective memory of playing a game of Battleship, most likely during elementary school recess, when the only two non-picked-over options are Battleship and half a deck of urine-stained Uno cards. And like a male anglerfish fusing to the much larger female anglerfish's body and becoming a living testicle, this meager nostalgia has affixed itself to the present, populist, SKRONK-SKRONK-PHWEESH edifice of the Transformers movies. If Battleship came out in the 1980s, it might have a theme song by Menudo. That's what happened to Rubik's Cube, after all. Think of Battleship as a tiny human pilot inside a 50-foot-tall Michael Bay golem made of box office receipts. You could switch out that pilot and nobody would notice, but people are reassured if they know who that pilot is. With this mind, it's abundantly clear Battleship 2 has zip need for the game Battleship. In fact, I've discovered an assortment of common objects on my kitchen table that will fuel the next three sequels. Mustache-twirling studio executives, please email me my requisite 46% of the domestic gross or risk legal action. Thank you. Everybody uses coat hangers. But what if aliens didn't use coat hangers? What if aliens had grenades that looked like coat hangers? And these grenades exploded? This could be a potent Invasion of the Bodysnatchers-meets-S.W.A.T.-style hybrid. Everybody receives junk mail. What if aliens could infiltrate by shapeshifting into junk mail? And this junk mail exploded? TWIST: The aliens are also copies of PARADE magazine. Marilyn vos Savant is an alien. Howard Huge is her trusted lieutenant. DOUBLE TWIST: I accidentally threw away my PARADE magazine yesterday. Everybody has seen random pieces of wax. What if these random pieces of wax were a code? A code from another planet? A code to make an explosive? From a planet that once exploded? And what if this planet smelled like Baltic Pine? Guest-starring Foxy Brown.